Sent in by Glenn Latimer, February 15, 2003. 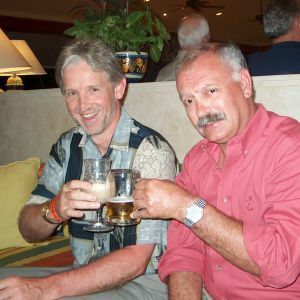 Chris Haywood and Glenn Latimer enjoy a cerveza in Riviera Maya, Mexico where they'd gone to get away from the cold of southern England and the COLD of Peoria, Il, respectively. 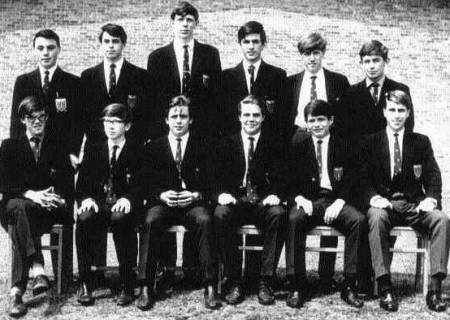 [...] we all went to Player school and I was good mates with Dave Wardle, Phil Barrett and Mick Falconbridge. I found your name again on the BGS web site where you wrote to Alan Gill. 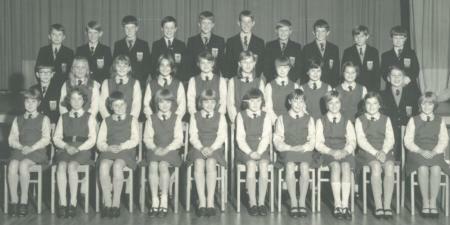 I've attached a photo of our first year at BGS (after we had spent our first year at Forest Fields) ... 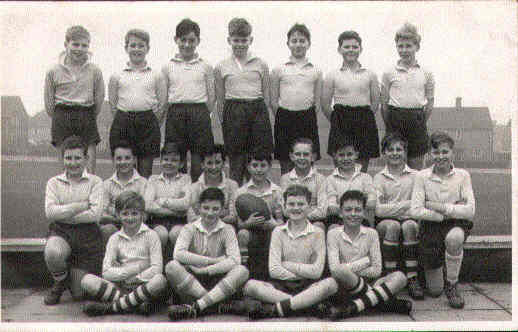 I'm on the second row, and second from the left (in between Dave Cannon and Malcom Carter) ... note Wardle and Barrett on the back row!!! [...] I live in Australia now (since 1969) ... have 4 kids and 7 grandkids!! Mick Upton, Chris Haywood, Glenn Lewinski, Dorothy Dix and twenty or so others held a reunion in Wollaton the last weekend of November 2001. I don't know if you'd be interested in the photo I found at home. 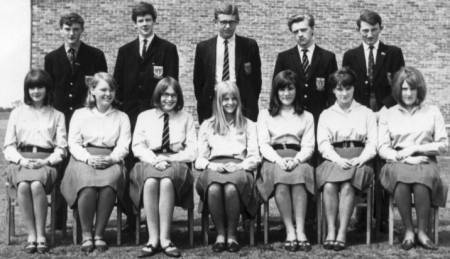 It is a group of us in the lower sixth. Chris [Haywood] sent me a similar one with him on -- obviously taken same day, same place. 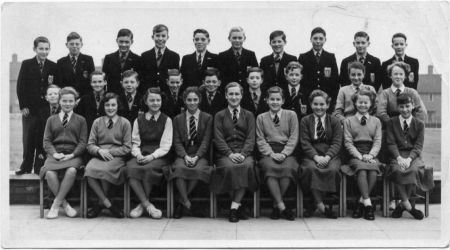 Neither of us can work out what the groups were -- form or subject groups. Perhaps someone will remember. Sent in by Chris Haywood. Glenn Latimer (formerly Lewinski), Chris Haywood, London, April 2001. 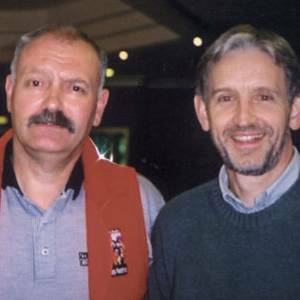 The two managed to meet when Glenn was over for the London marathon, having re-established contact through the BGS web site. Glenn found the site through an Internet search engine. Amazingly, he was looking not for BGS but for information on his grandfather. The engine turrned up the contacts page with Chris's comment, "Would love to hear from Glenn Lewinski." Sent in by Dave Fox. Taken on the bank by the tennis courts at the back of the science labs. Trevor Gibbons, David Fox, Robert Prew, Andrew (?) Selby, Brian Jones, Keith Hale, Michael Davies, Brian Connolly. Gail Yarnell, Jenny Woodburn, Margaret Sugden, (? ), (?). 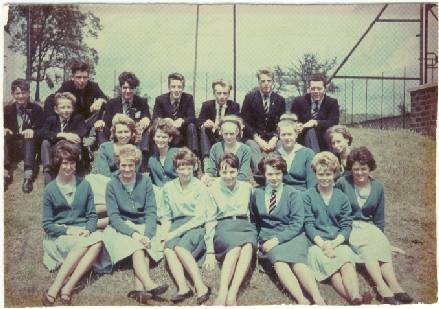 Christine Hemsley, Margaret Smith, Stevie Pawlikiewicz, Margaret Atkin, Zita Bramley (? 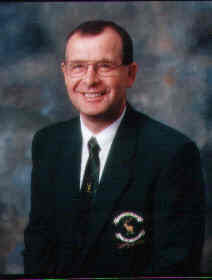 ), Pat Shepherd, (?). Sent in by Mick Upton. Chris (? ), Dave Brooks, (? ), (? ), Neil Hoskin, Russ Langford. 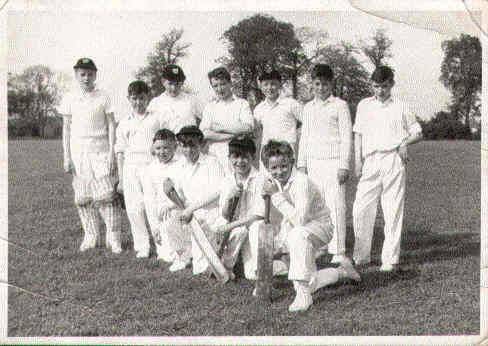 Chris Pratt, John Florio, Darrell Dodds, Jim Hofton, Mick Upton, Phil Gee.